We bring you our top 10 picks for the most trend-setting hotels that are currently luring design-conscious guests. Where: At 1685 Collins Avenue, just steps away from Lincoln Road Mall. What: This Art Deco icon was redesigned by Philippe Starck in 1995 as a minimalist masterpiece; his vision is best displayed in the cutting-edge lobby with its oversized mirrors, floor-to-ceiling drapes and towering columns. All of the 208 gleaming guestrooms are kitted out with brilliant white wood floors, crisp white bed linens and accents of more white. Rooms are generally small, yet sleek and sublime in décor and design; suites are more spacious and feature luxurious marble bathrooms and fabulously oversized marble soaking tubs. 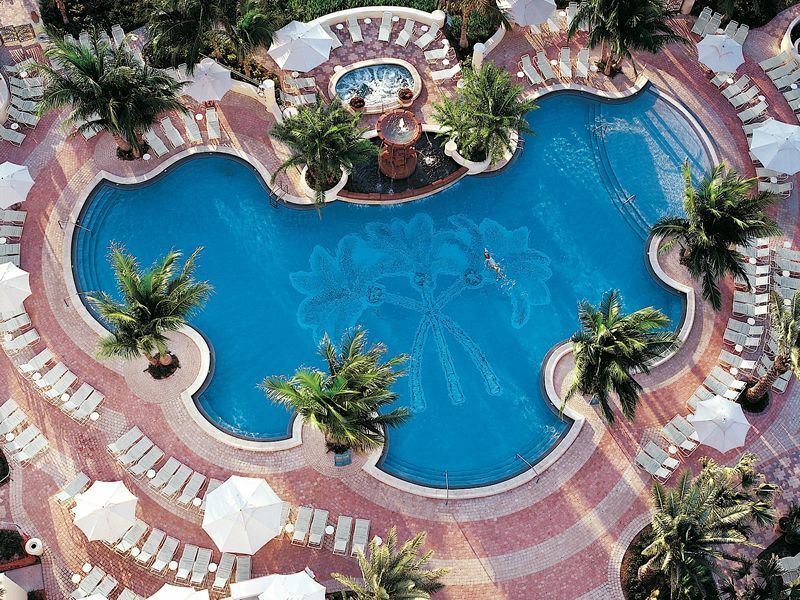 Hotel highlights: The infinity-edge swimming pool (also known as the ‘water salon’) is surrounded by palms, cabanas and swathes of beautiful people. There is a state-of-the-art fitness centre, a soothing rooftop Agua Spa, and plenty of furniture and objects d’art from the likes of Antonio Gaudi, Man Ray and Salvador Dali. Dine at Blue Door, a serene garden restaurant once co-owned by Madonna, and knock back cocktails at either FDR, Delano's subterranean see-and-be-seen party space, or at the Rose Bar which impresses with upholstered rose-colored walls and custom Venetian chandeliers. Where: At 1901 Collins Avenue in the heart of South Beach. What: Redefining cool on South Beach, this timeless Miami institution has been artfully redesigned by British modernist David Chipperfield with landscaping inspired by the Matisse-inspired colors of the Jardin Majorelle in Marrakech. There are 309 guestrooms and 70 oversized suites, each with Mexican sandstone bathrooms featuring customised glass enclosed ‘wet rooms’. The attention to detail is apparent throughout; white-on-white custom-designed furniture is accented with pops of bright colour. The landmarked Art Deco lobby - accented by Turkish tables, Kenyan throw pillows and a polished terrazzo floor - leads to a labyrinth of gardens with secret passageways, alcoves and outdoor 'rooms'. Hotel highlights: There are two elevated infinity pools; one is Olympic-sized and the other is a lap pool. Work out in the superb gym and fitness centre or indulge Zen-like pampering in the luxurious Spa at Shore Club, a sprawling 8,000 square feet rooftop sanctuary. Eat at Nobu, famed for its Japanese cuisine, and sample Italian fare at the new Terrazza restaurant. The celebrity-laden Skybar, with its four separate bars set within the tropical gardens, is the ultimate jet-set playground. Where: At 1601 Collins Avenue in the heart of the historic Art Deco District. What: Blending cosmopolitan South Beach chic and Art Deco influences, the elegant lobby of this sprawling upscale beachfront hotel sets the tone for the sophistication to follow; a domed ceiling, stately white pillars rising from polished marble floors and a large tropical aquarium. Each of the 790 newly-renovated spacious guestrooms (52 of which are suites) features high-end amenities and reworked bathrooms. All rooms offer sweeping views across the Miami skyline or the Atlantic Ocean. Hotel highlights: The freeform oceanfront swimming pool has direct access to a pristine 900-foot wide stretch of glistening sand. Relax in the new state-of-the-art poolside cabanas or indulge rejuvenating facials and massages at the immense Elemis Spa. Dining options are super swish: Sushi SoBe serves innovative sushi dishes infused with a South Beach touch, SoBe Scoops offers delectable ice creams and sorbets and the on-trend Hemisphere Lounge is the hippest spot for cocktail connoisseurs. Where: At 1671 Collins Avenue, between 16<sup>th</sup> and 17<sup>th</sup> Street. What: Know as the ‘Art Hotel’, this aesthetic boutique Art Deco District centrepiece doubles as an art gallery complete with 93 spacious and exquisitely-designed suites, including 15 two-story bungalows. The showstealer is the 1,800 square foot penthouse suite complete with a private elevator entrance, three bedrooms, whirlpool tub and an expansive terrace with sweeping oceanfront views. Although the décor is mainly all-white, the lobby, hallways, stairwells and public spaces are accented with of modern paintings, murals, photographs, sculptures and video installations from renowned and emerging artists. Hotel highlights: It’s pretty much all about the art at this all-suite oceanfront property. Owners Cricket and Martin Taplin have amassed a whopping collection of inspiring contemporary art and have installed 16 works from their private collection to share their passion with guests. Enjoy pampering by the infinity pool or in the sanctuary of your suite, savour regional American and international cuisine in the Gallery Dining Room and enjoy cocktails at the Art Video Lounge Bar. Where: At 1220 Ocean Drive, a prime South Beach location. What: Fusing rich Art Deco influences and contemporary furnishings, Tides is a Kelly Wearstler-designed slice of coastal cool. Each of the 45 suites has a panoramic view of South Beach and affords a soothing design scheme that mixes a monochromatic palette with, eclectic furnishings and whitewashed driftwoods to compliment large honey-hued marble bathrooms. Drain your wallet on the 2,600 square foot Tides Suite that features two bedrooms and a dramatic vintage dining room seating eight. The hotel’s magnificent lobby features high ceilings, original terrazzo marble, plush sofas and luscious trimmings. Hotel highlights: This 10-story Art Deco landmark exudes elegance, especially at the new La Marea restaurant; known as South Beach's Living Room it lures with oversized velvet chairs, looming chandeliers and a medley of American-inspired cuisine. Another intimate setting is the gold-hued Coral Bar where guests can sample the hotel’s signature cocktail - Tropical Popsicle Martini. For a peaceful oasis, head to the landscaped pool where a team of ‘Pool Personal Assistants’ cater to your every whim. Where: At 1440 Ocean Drive, located at the quieter northern end. What: This retro-chic Deco dame charms with signature plantation-style shutters, an expansive four-column portico and a Florida-Georgian architectural façade. Formerly known as the Betsy Ross Hotel, there are 63 elegant guestrooms and suites, all designed by former Ralph Lauren and Bulgari interior designers Diamante Pedersoli and Carmelina Santoro. Appointed in shades of white with stylish accents of ochre, coral and green, rooms enchant with bespoke cabinetry, walnut hardwood floors, custom-built beds and Thassos and Carrera marble bathrooms. For a quirky touch, suites are outfitted with an in-room library containing autographed books by renowned writers. Hotel highlights: There’s a pool, rooftop solarium and Wellness Garden spa offering a range of indulgent in-room or outdoor treatments and therapies. By day ask concierge to pack a picnic basket to take to the beach; by night feast on Laurent Tourondel's interpretation of steakhouse fare at BLT Steak, sip signature cocktails in the Lobby Bar and party at B-Bar in the hotel’s basement. Where: At 660 Washington Avenue, located on Washington Avenue and 6th Street. What: This stately Mediterranean-revival style building was meticulously restored by famed Miami architect Allan Shulman; interiors were created by the late South Florida interior designer and developer Wallace J Tutt, famed for his work on Gianni Versace's South Beach mansion. There are 46 spacious guestrooms, all designed in earth tones with lashings of cream, beige and white with bamboo wood floors. Bathrooms are generously sized and have white marble tiled floors. Hotel highlights: Beyond its enviable location on the edge of SoFi (south of Fifth Street) there is plenty to please discerning guests; from lazing on plush loungers by the small outdoor pool to heading a mere two blocks away to the designated private beach. The hotel’s intimate restaurant, 660 At The Angler’s, offers indoor and outdoor dining and offers an exciting Latin-fusion menu. Where: At 1701 Collins Avenue at 17th Street. What: Opened in 2012, this stylish newcomer has created a buzz for both its estimated $80 million development cost and its high-octane mix of whimsical South Beach glam and Californian luxury. Under the direction of nightclub owner-turned-hospitality magnate Sam Nazarian, Philippe Starck devised the hotel’s visually compelling ultra-modern look whilst rocker Lenny Kravitz created the penthouse suite and a private bungalow. There are 140 beguiling guestrooms and 10 luxury bungalow suites, each with design elements inspired by old French aristocracy, in particular Louis XV's legendary mistress and courtesan Madame de Pompadour. Hotel highlights: The Bazaar by acclaimed Spanish chef José Andrés is a gourmet feast for the senses whilst Katsuya by Starck - the dynamic pairing of Master Sushi Chef Katsuya Uechi and the design impresario - is a sushi temple specialising in cocktails, sushi and sashimi platters. Get the party started at the hotel’s newly-debuted Hyde Beach nightclub, an uber-stylish 8,000 square feet indoor-outdoor space surrounding two swimming pools. Where: Oceanfront at 4441 Collins Avenue in the heart of Millionaire's Row. What: Following a jaw-dropping billion-dollar makeover, Miami Beach’s curvy 1950s creation was given a design overhaul in 2008. Two new all-suite towers were added and original Art Deco details were restored including the bow tie patterned tiles in the lobby and the legendary floating ‘Staircase to Nowhere’. Each of the 1,504 guestrooms is outfitted in shades of off-white; bathrooms are decked out in white marble and granite with whirlpool tubs. All rooms are equipped with a personal 20-inch iMac and most offer sweeping Atlantic views from the balcony. Hotel highlights: The two-level 40,000 square-foot Lapis Spa features 30 private treatment rooms and boasts a star-studded clientele. Laze by the European-style pool surrounded by cabanas and sun lounger and take lunch at La Cote where French-styled cuisine is presented in a two-level restaurant situated beach and poolside. Start your evening in the lobby's Blue Bar, book a table at either Alfred Portale’s Gotham Steak or Scarpetta, and dance at LIV, the hotel’s upscale high-energy nightclub with over 18,000 square feet of striking architectural design and lavish décor. Where: At 1116 Ocean Drive, steps away from the white sands of Miami Beach. What: This iconic pleasure palace is housed in fashion designer Gianni Versace’s former villa - the 1930s Casa Casuarina. Opened as a boutique resort by eponymous restaurateur and impresario Barton G. Weiss in 2009, this Mediterranean-styled oceanfront hotel is a flamboyant showcase for 10 exemplary suites that surround an interior courtyard. Each majestic suite is a visual feast complimented by oversized Italian marble bathrooms. Outrageously over-the-top, eclectic furnishings include animal-print ottomans, custom-made gilded Louis XIV-style beds with Frette linens and mink throws, thick rugs and plenty of Versace fabrics. Hotel highlights: The Thousand Mosaic Pool lined with 24-carat gold, is perfect for a dip, whilst The Rooftop Lounge is the ideal spot for a nightcap under the stars. Inside The Villa, guests can enjoy the comfort of two private lounges and dine in The Dining Room at Villa by Barton G, one of Miami’s premium eateries. Famed for its pebble-mosaic walls, stained-glass windows and frescoed ceilings, the restaurant offers ground-breaking interpretations of classic European cuisine, all served on original Versace-Rosenthal china.